Call us today at (501) 803-9700 for a swift, effective response to your disaster. If you find that pipe leak has left water damage in the hardwood flooring of your living room, it can be difficult to relax and overwhelming to consider cleaning up such a mess on your own. When a leaky pipe creates water damage in your Little Rock rental home, SERVPRO has the means to eliminate moisture and save your structure from potential mold proliferation. Our team can be at your home within hours to move, dry, and disinfect affected furniture as well as address the accumulated moisture in your hardwood floor. With wood, it is especially vital to keep moisture levels low to prevent structural damage and mold growth, and our professionals can use moisture meters with long, Teflon-coated probes to monitor both your floor and subfloor's moisture levels while drying. Our team can use tenting to remove water from your flooring more effectively. This process involves covering flooring at ground level with a large sheet of plastic that is usually about 6 millimeters in thickness. Once taped down, this plastic helps pull moisture in the air out of surfaces more rapidly and can be used in combination with dehumidifiers during drying to capture more water vapor. When treating hardwood, it is vital to mitigate any permanent buckling, cupping, or warping of the flooring. During drying, centrifugal air movers can be positioned to pull up moisture from both on top of and underneath the floor, which can also help dry the plywood subfloor. SERVPRO technicians can use desiccant dehumidifiers to absorb this moisture and lower humidity considerably with the aid of materials like silica gel. In open areas like a living room, polyethylene chambers are often crafted to create smaller, contained chambers for faster drying. SERVPRO of Northwest Little Rock is dedicated to providing the area with 24/7 disaster cleanup. Call us today at (501) 803-9700 for a swift, effective response to your disaster. 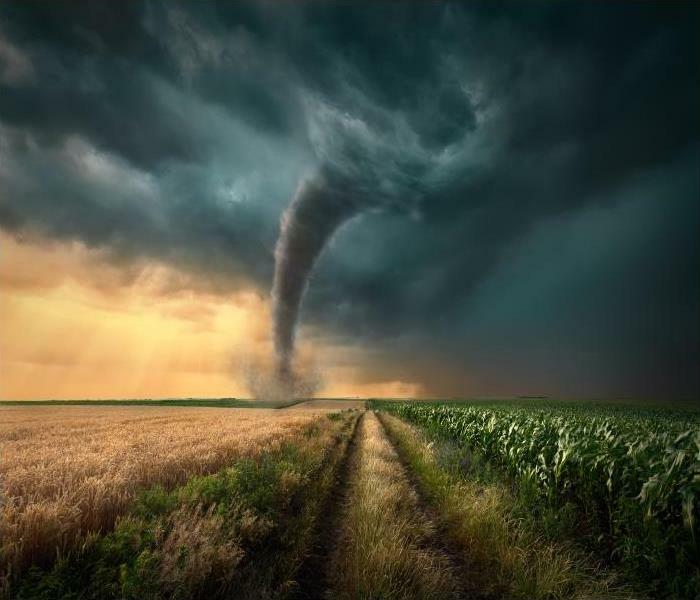 Spring often brings strong storms to Arkansas, and it is crucial to spot check your property after a rainstorm to ensure there is no damage to the roofing or around windows or doorways. 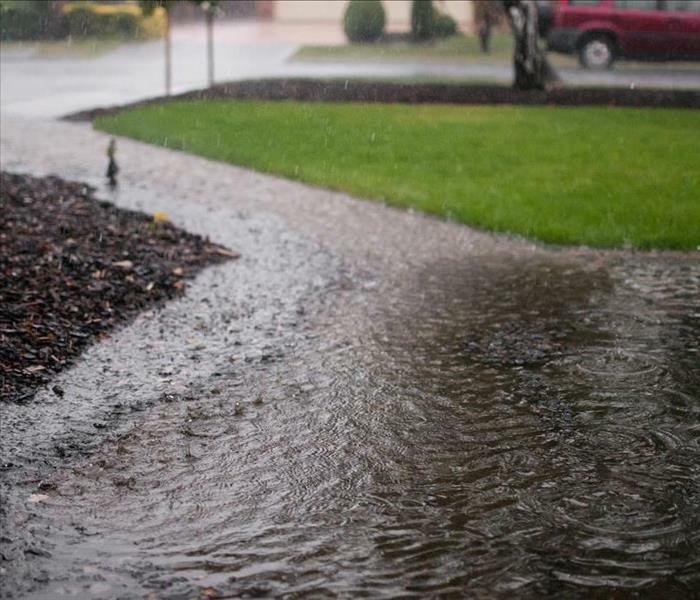 If there is damage from high winds or hail, water can find a way into your property. 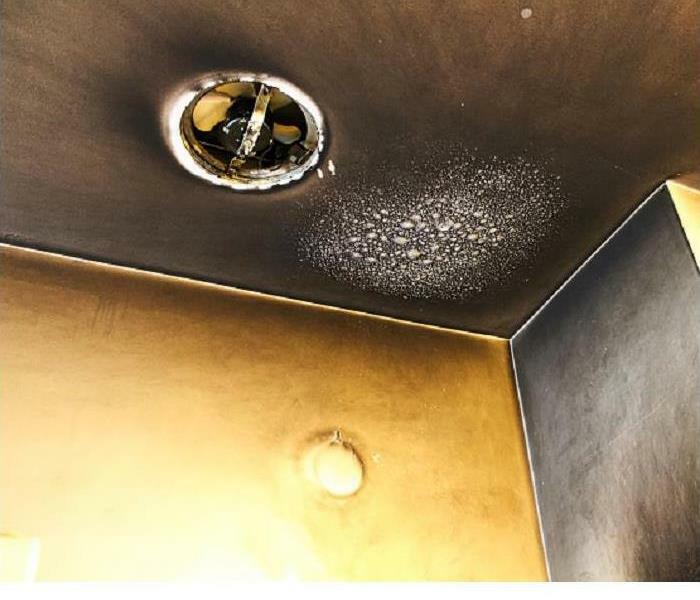 The commercial water damage in a Little Rock dermatologist office happened during a storm when water ran through loosened flashing around a vent on the roof. The next morning the staff entered the office to find soggy ceiling tiles, and the front of the office saturated. They contacted SERVPRO, and our technicians arrived on site to extract the water that was left around the front desk area. The ceiling tiles were taken out, and the roof was tarped to stop any further water damage from occurring. There was little water left, but the moisture readings indicated high levels of moisture in the ceiling area and the wall behind the desk where the water ran to the floor. It was determined that the wall was not a water loss, and the subflooring was unaffected as the seal on the tile was completely intact. We drilled some weep holes into the walls and forced in some warm air. We remove as much moisture as possible before setting up the air movers as it speeds the drying process. We paid particular attention to ensure the ceiling area was dried thoroughly. To leave the premises sanitary and inhibit microbial growth, our technicians clean all surfaces affected by water. In this case, only mild odor control was needed to neutralize the residual water odor. Our SERVPRO location offers building services, and we were able to suggest to the owner the best course of action for fixing the flashing and replacing the unrestorable ceiling tiles. Commercial water damage can lead to costly secondary damages if it is not cleaned up properly. Call SERVPRO of Northwest Little Rock at (501) 803-9700 and our team can go to work for you immediately. Welcome to our city, click right here. Who Can You Rely For Flood Damage Restoration? SERVPRO, Of Course! We are here to help our community whenever flood disasters strike. Many Little Rock homeowners might hear the term mitigation and not know precisely what it means. When we use the term mitigation, it is a process that involves intricate equipment and fast responses to reduce damage and loss to your property. The objective with prompt mitigation for emergencies like flooding is to save you money and time for the restoration to fully complete, reducing both the spread of the damage through your home and the materials that could ultimately require replacement. While some types of flood damage can leave your Little Rock home susceptible to contamination and bacterial threats, many of these conditions occur from storm damages that allow direct water penetration through missing windows, a damaged roof, or other structural concerns. 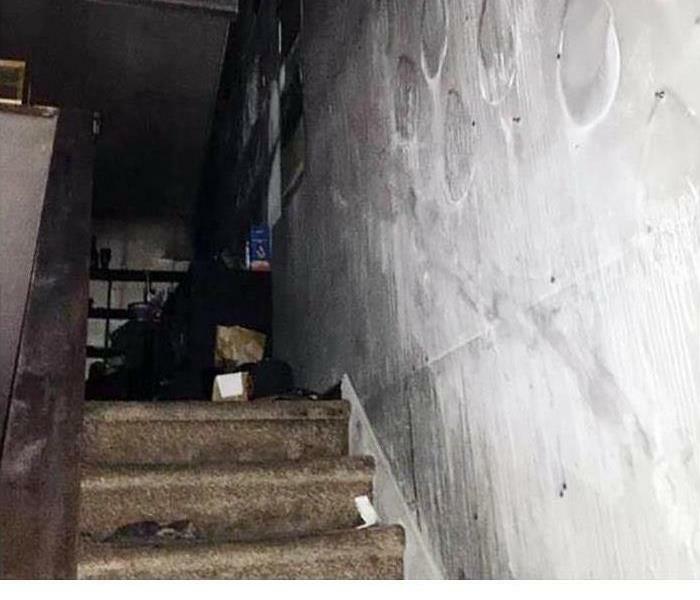 In these situations, many of the exposed materials and structural elements can get preserved and protected if our SERVPRO rapid response team gets notified of the emergency right away. Our Green Fleet stays stocked with effective equipment designed to maximize the efficiency of mitigation once our professionals arrive at your home. 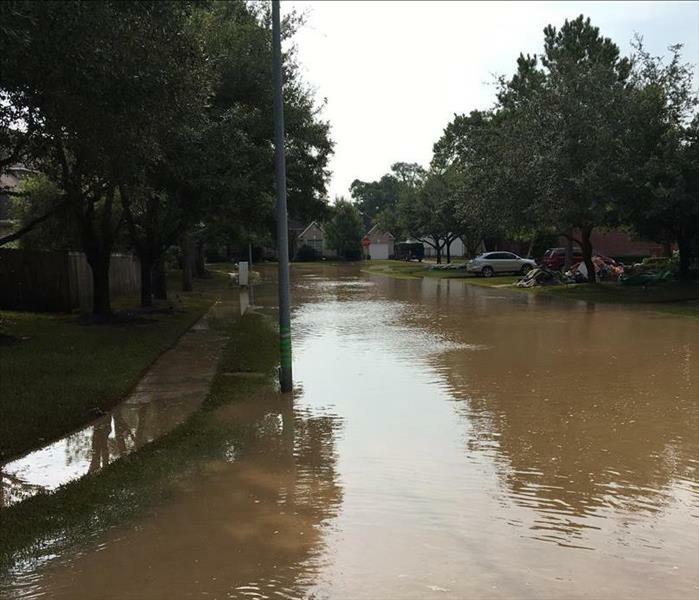 From high-powered extraction equipment like our truck-mounted and gas-powered pumps to our portable sump pumps and wet-vacs, we can remove the excess water from all affected areas of your house quickly to get needed drying efforts started immediately. A thorough inspection of the property can determine which construction materials must get removed and replaced to restore your home entirely. In many cases, partial removal of the bottom of drywall to a set moisture line can allow a more efficient reconstruction process and allow access for our effective drying equipment to penetrate wall cavities and other inaccessible areas more easily. Whenever flood damages affect your home, you must act quickly to secure the services of our SERVPRO of Northwest Little Rock rapid response team. 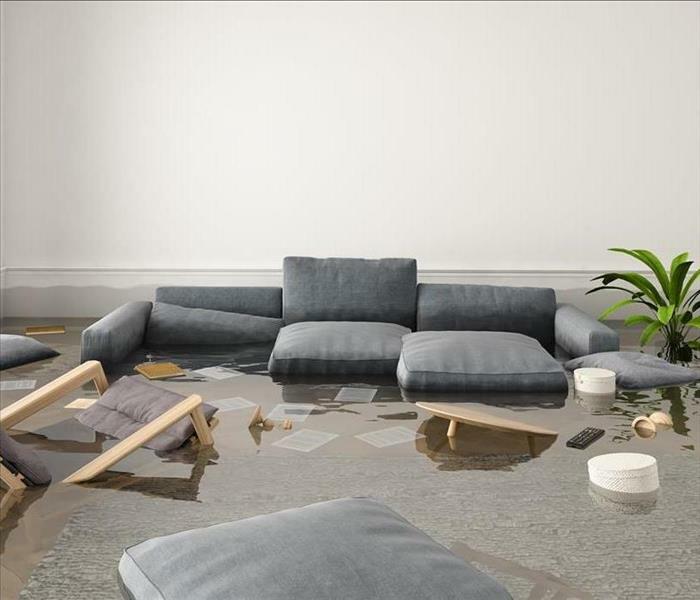 With effective mitigation strategies that we can begin immediately when we arrive, our technicians can make any flooding in your home “Like it never even happened.” Give us a call anytime at (501) 803-9700. For more on Little rock, click here. Our trained technicians have the right equipment to get your business up and running again after a fire. Call us day or night we are available 24/7. How to Handle Fire Damage to Your Little Rock Office Contents? Pack It Out! When a fire in your office building in Little Rock brings business to a standstill, partnering with the regional restoration leader offers the promise of a fast and successful resolution to the problem. Structural remediation projects after disaster slow when furnishings, documents, and equipment need care as well. Commit to offering your business the best chance of thriving after a fire catastrophe by using our pack-out service. An intricate web of tasks faces a business owner when fire damage strikes in Little Rock. Because significant amounts of water usually remain in the structure after firefighting efforts, the first job we take on is water removal and drying. Then hours of soot cleanup, charring reduction and restoration, and deodorization follow. Moving office furnishings, electronics, samples, documents, and other non-fixtures out during remediation of structural components clears the space for efficient water and fire residue removal. Packing out the contents of your office is a safe and sensible option for our business clients. SERVPRO features the Contents Claim Inventory Service (CCIS) to ensure our commercial customers a stress-free experience. Using a combination of detailed lists, digital images, and barcoding, we create a comprehensive record of the items we move to our production facility. Our technicians evaluate the condition of each article and develop a plan to clean and restore the inventoried items. SERVPRO technicians train extensively, mastering IICRC courses to prepare for the complexities of fire restoration. We match cleaning methods and products to the soiling, clearing away soot and debris in anticipation of final touches such as repainting and the return of restored pack-out items. SERVPRO of Northwest Little Rock gives commercial customers many options to emerge from the aftermath of a fire with renewed vigor. Call us at (501) 803-9700 to set up an assessment after the firefighters return your property for restoration. Learn more about BikePed Little Rock click here for more information. SERVPRO can remove the smoke and soot from your home. Call us today! After initial removal of the visible signs of fire damage, odor from the smoke and soot remain in the home. Humidity can compound the scent, and if not contained, it can spread to areas of the home unaffected by fire. Last but not least, the clock is ticking. The longer the odors remain in the house, the more embedded they become. SERVPRO has many resources available to eliminate the lingering odor from a fire in Little Rock homes. The methods we use to treat the smells in the house depends on the type of residue left by the blaze. Plastics and synthetic materials leave oily, heavy residues. Wood and building materials tend to deposit lighter layers of soot and smoke odor that are less messy to clean up. We utilize both wet and dry cleaning methods to effectively remove all visible traces of fire damage to restorable items and surfaces. However, the unpleasant odor remains and has the potential to spread. To stop cross-contamination, we contain the area where the fire occurred and examine items in the room to see if they are restorable through cleaning efforts or if disposal is the only option. Many homeowners are pleasantly surprised at how we save items through intense cleaning efforts. 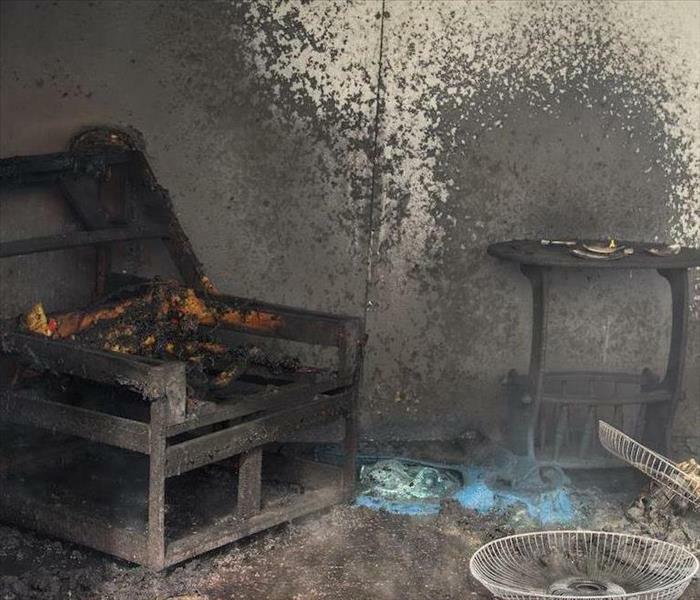 Just because books or papers were in the vicinity, it does not mean they are automatically a loss due to smoke damage. Our highly skilled technicians use the same methods as the Library of Congress for the forensic restoration of fragile, valuable books and documents and apply those methods whenever feasible to mitigate property loss from fire. Upholstery and carpeting can retain unpleasant odors after the fact, and we often utilize thermal fogging as a very effective method for eliminating foul scents in porous items. Our certified OCT (Odor Control Technician) uses a heated fog of deodorizing spray throughout the area, and it penetrates wherever the smoke went, overtaking and neutralizing lingering odors. SERVPRO of Northwest Little Rock has the experience and resources to eliminate fire damage odors from your home. Our highly trained technicians are ready to assist you 24-hours a day. Call (501) 803-9700 and one of our certified technicians can help you get your home back to normal, "Like it never even happened." Read about the Little Rock Fire Department here. When you contact our SERVPRO team, we help remediate both the content and structure of your home. Sometime packouts are very useful to that end. Mitigation is a vital component of disaster recovery for your Little Rock home. Our technicians respond to emergencies like fires quickly to ensure that we can limit the loss to both your property and the contents of your home. It is important for homeowners to react quickly to get trained personnel into their home following the extinguishment of the fire so that strategies like pack-outs can be most effective. While you might have many concerns for your property after the incident, fire removal efforts in Little Rock and content protection are the first steps that professional restoration technicians like ours take when we arrive at your damaged house. Much of this initial work that we do also goes to help provide your insurance company with the necessary information and documentation that they require to approve a damage claim and afford restoration work for your property. Mitigation work initially often involves the assessment of the damage and beginning to remove debris and overly damaged structural elements to get down to the skeleton of your home in the damaged areas and ultimately rebuild it. We can test materials for structural integrity to exercise our controlled demolition techniques that only remove the portions of your home’s construction that are too badly damaged to preserve. You might find a fire in your home to be an overwhelming experience, but you can count on our SERVPRO of Northwest Little Rock to respond quickly with the experience and tools to help begin recovering your home. Give us a call anytime that disaster strikes at (501) 803-9700. Click here to read more about Little Rock. 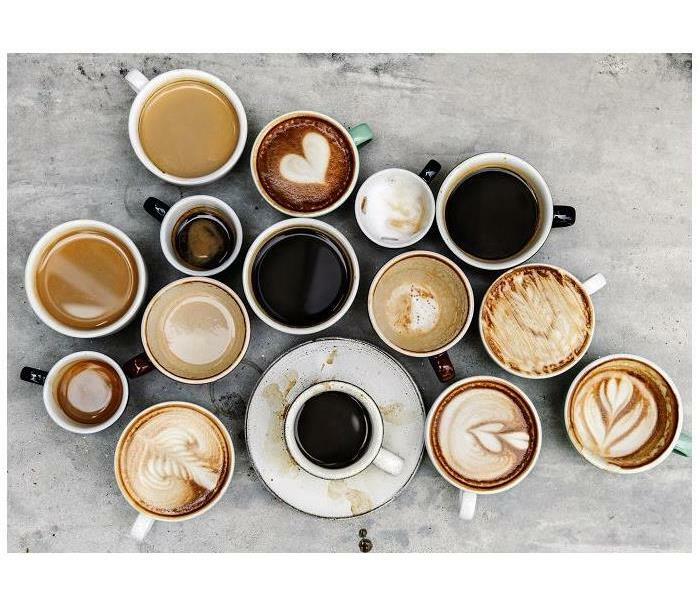 Are You Serving Water Damage in Your Little Rock Coffee Shop? When water invades your coffee shop, call SERVPRO Franchise professionals to restore your business. Water damage from a storm is severe enough in it happens in a home. When it comes in the form of commercial flood damage, it can disrupt the livelihoods of employees as well as threaten closure of the company if the establishment isn't returned to normal operations quickly. SERVPRO dispatched to a Little Rock coffee shop to mitigate the damage left after a storm. We classify floodwater as gray or black water due to contaminants ranging from toxic substances in the runoff to sewage. Since this is a public place, it must be thoroughly disinfected to meet health department standards. Our emergency services have the goal of disrupting business operations as little as possible and get your business open again to avoid devastating revenue loss. Powerful truck-mounted pumps effectively pull water from the floors. Tables and chairs were removed and placed in another area since only the legs were affected by the flood water. Our technicians spend time when accessing a water damage situation to determine the best set up the fastest drying. They used industrial air movers that drove strong currents of targeted air up and out while dehumidifiers reduced the moisture for complete drying of the flooring and objects. Once the area looks dry, SERVPRO technicians verify it through the use of digital moisture detectors before moving to the next step in the restoration process. Both disinfecting and deodorizing the shop were high priorities for our technicians. 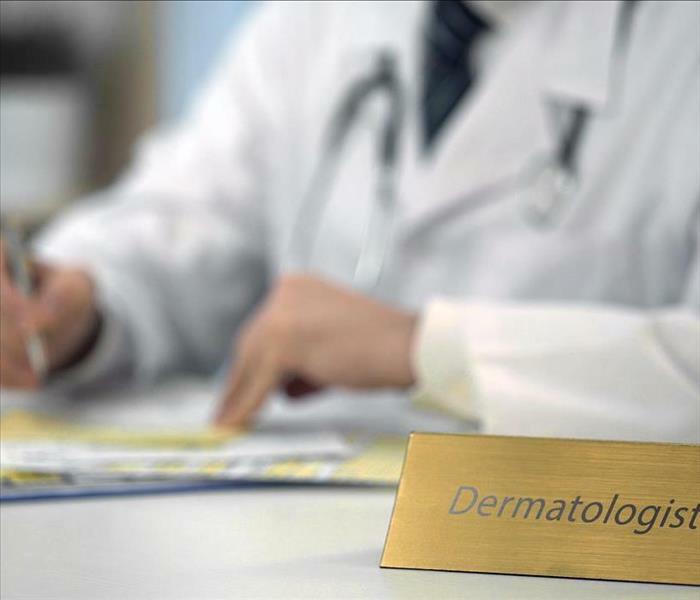 Strong antifungal and antibacterial solutions were used on surfaces to stop the growth of mold and harmful bacteria. As a final step, a ULV fogger was used to thoroughly deodorize the coffee shop and get it ready to reopen smelling fresh and clean. We know time is of the essence when your business suffers flood damage. SERVPRO of Northwest Little Rock has emergency services available 24/7. Just call (501) 803-9700 for one of our certified technicians to begin restoration on your business. After a flood, give us a call, our team is available 24/7, seven days a week to handle your restoration process so you can get back to normal living. When an excessive amount of water enters your Little Rock modular home, there is a good chance that some building materials and contents inside your house can get damaged. If water starts to build up outside, it can find its way into your mobile house and require you to call in a professional flood demolition company such as SERVPRO. Moisture entering from the outdoors first saturates the carpet before it starts to soak into other materials. Saturated carpets can damage your subflooring materials and then moisture can start to wick up your walls horizontally. If the damage gets severe, portions of your drywall may have to be removed as a part of the flood demolition phase. When moisture comes in from the bottom and works its way up, it sometimes must be cut up a foot or two from the floor. When our SERVPRO technicians test the drywall in your home with moisture sensors, and we find out it is wet, flood demolition in Little Rock can become a part of the overall project. When the drywall gets tested as being wet, we use our moisture sensors to see how far up the wall the water has gone. We then cut the drywall about six inches to a foot from where moisture was last detected. After the drywall gets removed, we then begin drying out carpet, your contents, and your wall cavities. Making these "flood cuts" and removing a portion of your drywall allows our SERVPRO technicians to set up equipment that pushes air into your wall cavities and helps dry out your wooden studs and exterior wall components. Removing moisture from these organic substances helps prevent future mold growth. After all of the materials inside your mobile home get dried out, and our moisture sensors prove levels are back to what they were before the flooding occurred, we replace and patch your drywall. If the project requires more than what we can handle we can utilize a certified subcontractor for the reconstruction work. If you ever have a problem with wet drywall after a storm, call SERVPRO of Northwest Little Rock at (501) 803-9700 seven days a week. Learn more about the Department of Community Programs click here for more information. Flood damage doesn't stand a chance when SERVPRO of Northwest Little Rock is involved. Storms can happen any time in Little Rock, but it is hard to anticipate the kind of damages they cause. The storm can leave you grappling with the removal of sludge, debris, and contaminants from rising water. Strong winds during the storm or driving rain can deposit water in areas otherwise unreachable by rising water. When you seek help from a professional restoration service like SERVPRO, you have the best chance to recover from such incidents. We use advanced technologies to complete the job fast, cost effectively, and with long-term results. Many times floods damage in Little Rock involves flooded crawl spaces especially if caused by a tropical storm or hurricane. Removing such water fast is necessary to prevent damage to support beams. Such confined spaces are also hotbeds for mold development, which is easily accelerated by excess moisture from the floodwaters. Our SERVPRO technicians use water extraction equipment to remove the accumulated water from the area fast. To forestall future incidents, we can do crawlspace encapsulation, which protects the area from accumulated through absorption. Stormwater easily soaks into walls leading to both moisture and contaminants accumulation. Removing the affected materials is the safest option since no cleaning option guarantees removal of all contaminants. Demolition increases the costs involved which is why SERVPRO technicians perform flood cuts instead. This controlled demolition removes the affected porous materials and creates space to clean the areas with antimicrobial agents. Most importantly, it helps save the cost that you would have wasted through demolition. Most properties affected by floods also experience odor problems during the actual incident or later on. Bad odor can occur due to the contaminants present in floodwaters such as sewage or industrial chemicals. It can also occur due to microbial growth after failure to dry the affected areas properly. Our SERVPRO technicians take different measures to deal with odor. We use advanced equipment such as air scrubbers and foggers to remove odor particles and disperse deodorizing agents respectively. We prefer deodorizers that pair with odor particles neutralizing them instead of masking. We also use industrial grade dehumidifiers and high-speed air movers to remove all excess moisture. With help from SERVPRO of Northwest Little Rock, controlling the damage left after flooding is easy. 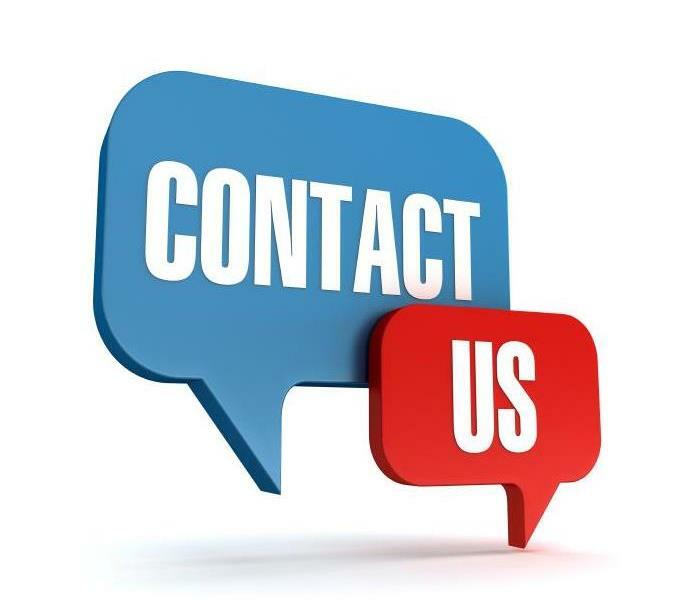 You can reach us at (501) 803-9700 any time. For more information regarding the city of Little Rock, click here. 3/29/2019 - Who Can You Rely For Flood Damage Restoration? SERVPRO, Of Course! 2/18/2019 - Are You Serving Water Damage in Your Little Rock Coffee Shop?